PhDs Hans-Jurgen Grande and Ramón Tena appear on the list of twenty-one researchers honoured on 21 November in acknowledgement of their work in the context of the Basque Science, Technology and Research Network. 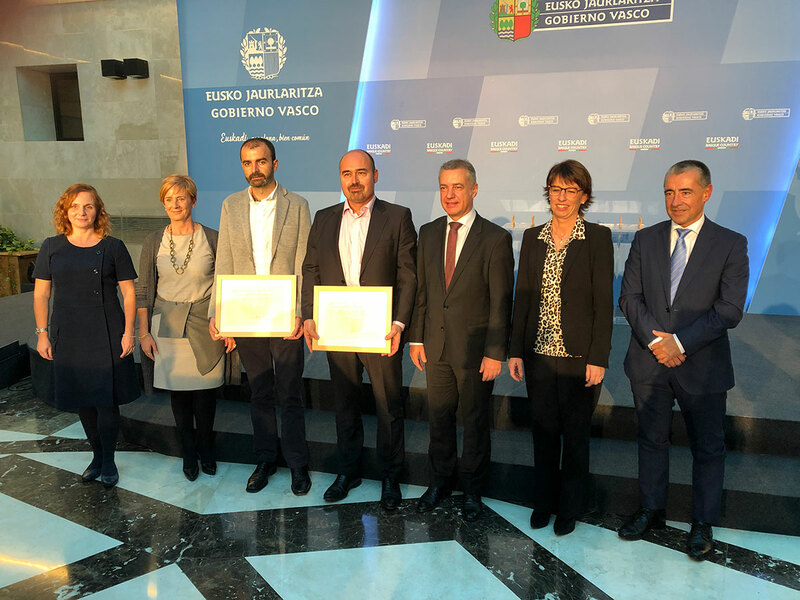 The event, promoted by the Department for Economic Development and Infrastructure, was presided by Lehendakari Iñigo Urkullu, with each of the honourees being awarded a diploma of acknowledgement for work done over the last few years in fulfilment of their functions in Technological Centres and cooperative research centres (CICs). The event agenda included a meeting with the Basque president, councillorArantxa Tapia and vice-councillor EstibalizHernaez, during which the Lehendakaristated: “The centres where you work are vastly improving their results these days, generatingbetter-quality R+D+iprojects and implementing greater effective collaboration among different agents. And not only is the Government saying so; the companies are also experiencing this change first-hand”.